What are Bed Bugs and Can My Pet Get Them? Bed bugs create quite the buzz in homes, hotels, schools, and anywhere else they've been discovered recently. Similar to fleas and lice, bed bugs are small but also problematic when they decide to populate an area. Warm-blooded animals, including those that are our pets, are unfortunately prone to getting a variety of insect infestations, including bed bugs. Bed bugs are small insects. They do not have wings so they aren't able to fly to new locales so instead they catch a ride on clothing, in book bags, or on shoes. When fully grown, these insects are only 1/4 of an inch long but can lay up to 500 eggs during their short life. They feed off of warm-blooded animals at night using their mouth part called a proboscis. The old saying, "Don't let the bed bugs bite" came from just that - bed bugs that bit people back in the 1800's. These pesky bugs, which have been around practically forever, were thought to be a problem of the past when pesticides were not routinely used or available but they've made a reappearance in recent years. Bed bugs can populate a home, school, theater, hotel, or other environment regardless of how clean it is. They crawl into book bags, clothing items, luggage, and other things that go from place to place. They then find a host to latch onto, which is usually a human. They are found in the environment just like other insects but can be difficult to get rid of due to how quickly they reproduce. Kids can bring them home with them from school, hotels get them from other people who brought them there, and you can take them home with you from theaters, and other public places. How Does Your Pet Get Bed Bugs? 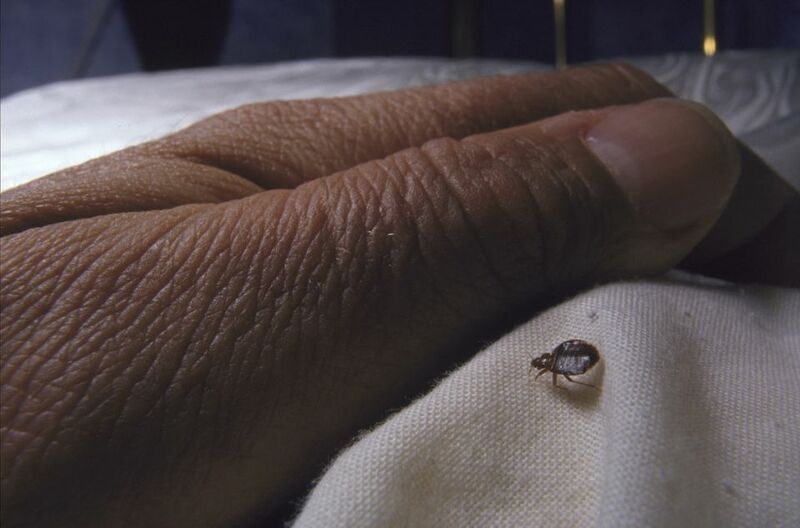 Bed bugs will take the easier meal to get to so since humans don't have fur to bury through like most pets, bedbugs will usually bite a human over a pet. But that doesn't mean pets such as dogs, cats, rats, guinea pigs, rabbits, ferrets, mice, and even birds won't be the victims of a blood meal. If bed bugs are brought into your home then you and your pets are at risk for being bitten. How Can You Tell If Your Pet Has Bed Bugs? Aside from seeing the actual bed bug on your pet (it may be hard to find since many pets like ferrets, rabbits, rats, and cats are so meticulous when they groom themselves) you may see bites, your pet itching themselves, or dead insects in your pet's cage or around the house. How Do You Get Bed Bugs Off Your Pet? Since most bed bug sprays are toxic to not only insects but to your pets you need to be careful what you use to rid your pet of their pests. Many bed bug exterminating companies will recommend you remove your pets from the house when they come over and spray your home so these companies are only a good option to treat your home, not your pet or their cage. To get rid of bed bugs without spraying insecticides you can start by throwing out any bedding, food, or litter that is open, especially if your pet has used it. If you need to try to salvage something that is unused but open, and in an area your pet frequents, you can freeze it to kill any bugs that are in it. Thankfully bed bugs do not live on pets long term like fleas, mites,and lice do so you shouldn't have to treat your pet with any pesticides. If your pet endures an extreme number of bites or has any reactions to the bites (infections, anemia, etc.) they may require medical treatment. Otherwise you can simply comb off any bed bugs you find on your pet using a flea comb. Frequent vacuuming and laundering of all bedding, towels, etc. should be done to eventually get rid of the infestation. It may take time to eradicate all the bed bugs if they have laid eggs in your home and pesticides may need to be utilized for heavy infestations.